There are two critical parameters that all lasers diodes must meet to begin the lasing process. The first one of these parameters is that there must be more gain than loss inside the laser cavity, the point at which this condition is satisfied is known as the gain threshold and was covered in the last installment in our Laser Diode Fundamentals series. The second condition that must be met, is that there must be a longitudinal mode present inside the optical cavity which coincides with the laser’s gain curve. In this blog post, we are going to explore what precisely longitudinal modes are and how they affect the performance of a laser diode. All lasers must contain three key components, a gain material, a resonator cavity, and an excitation source. For us to understand what a longitudinal mode is and where it comes, we will first ignore the gain medium and excitation source, focusing solely on the resonator. To further simplify our initial analysis we are also going to assume that both mirrors in the resonator are 100% reflective, this is known as an ideal resonator. In this case, all of the light waves are then trapped inside of this cavity, creating a standing wave inside as the light travels back and forth between the two mirrors. Just like in a vibrating string an infinite number of standing waves can exist inside of this cavity, but they all must have a node at the two mirrors. 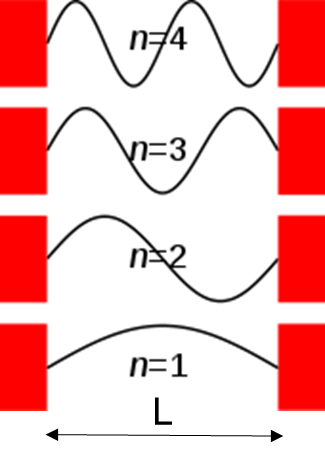 Therefore, as is shown in the figure below the wavelength or frequency of these standing waves are governed by the length of the resonator, with the lowest order mode having a wavelength of one half the cavity length and each higher order mode have a wavelength equal to ½n , where n in the mode number. 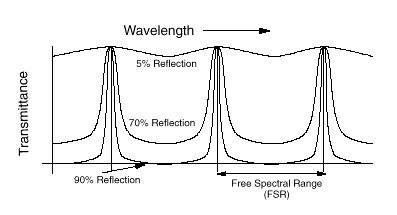 By taking into account the relationship between frequency, wavelength, and index of refraction it can be shown that each mode in the cavity will be spaced out according to the relationship , called the free spectral range, where c is the speed of light, n is the index of refraction, and L is the cavity length. As a result of this quantization of allowable frequencies/wavelengths in the laser cavity, we can see that there are an infinite number of modes that can fit into an optical cavity all with equal frequency spacing. These are known as Fabry-Perot modes, and heavily influence the spectral characteristics of the laser. In reality, no mirror is perfectly reflective, and in fact, if they were, we wouldn’t be able to get any light out of a laser rendering it useless. Since every resonator will have some loss at the mirrors, the Fabry-Perot modes are not pure delta functions, but instead, they have a certain linewidth dependent on the reflectivity of the mirrors. A detailed analysis of the causes of this line broadening is beyond the scope of this blog post, but the figure below shows several examples of how decreasing the mirror reflectivity effects the mode structure. When you superimpose the laser diodes gain band on top of the Fabry-Perot modes, as shown in the figure below, you are now left with the total number of allowed spectral modes. These modes are referred to as the longitudinal modes of the laser and are the only allowable wavelengths at which the laser can amplify and emit light. If the gain at a particular longitudinal mode is greater than the total loss in the cavity (the gain threshold), that mode will be amplified and lasing will occur. This interplay between the gain threshold, gain bandwidth and longitudinal mode spacing is what ultimately determines whether or not a diode operates as a single or multi-mode device. If the gain threshold is significantly high and the gain bandwidth substantially narrow to allow for only one mode to lase it is considered to be single longitudinal mode (SLM). 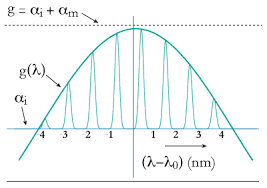 Inversely, If the gain band is substantially wide and threshold significantly low to allow for many modes to lase at once, it is considered to be multi-longitudinal mode (MLM). There are advantages and disadvantages to both multi-longitudinal mode and single longitudinal mode diode lasers. For example, multi-longitudinal mode diode lasers are generally more straightforward and more cost effective to manufacture. Additionally, the larger number of modes typically allows for much higher power to be generated by the device. Single longitudinal mode diode lasers though have a much narrower bandwidth which makes them more desirable for applications where precise knowledge of the wavelength is required. But as a result, these diode lasers are typically much lower power and more challenging to manufacture. Now that you have developed an understanding of the basic principles underlying longitude mode structure, in the next blog post for our laser fundamentals series we will explore how you can design a laser to ensure that it operates with only a single longitudinal mode. In that post, we will discuss how this can be done either by adding external optical elements to a tradition laser diode or by modifying laser diodes structure itself to allow only one mode to reach gain threshold. Here at RPMC Lasers, we have over 20 years of experience with diode lasers and are readily available to assist you in not only deciding which of our standard off-the-shelf laser diodes are ideal for your application, but we are also able to offer countless custom laser diode packaging configurations with a wide range of integrated optics include all of the designs discussed above. For more information about our wide variety of laser diodes you can click here, and for more information about laser diode fundamentals be sure to visit our Lasers 101 page.